Washington • House Democrats, concerned that President Donald Trump’s attorney general may withhold evidence of wrongdoing uncovered by special counsel Robert Mueller, are preparing for potential battle over access to the full contents of Mueller’s newly completed report, vowing to pursue it and any underlying investigative materials in court if necessary. 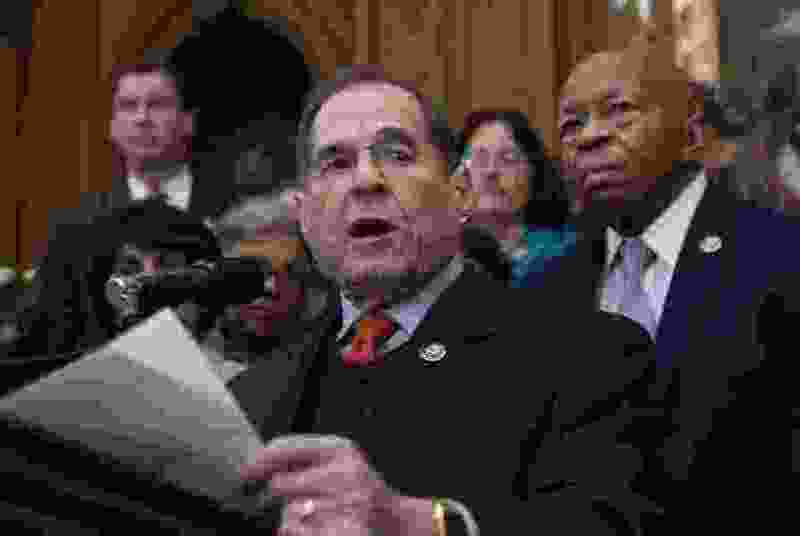 "We will fight" for the full report, said Rep. Jerrold Nadler, D-N.Y., chairman of the House Judiciary Committee, emphasizing that Democrats expect complete transparency from Mueller and the Justice Department, save for redactions of classified information that could jeopardize sensitive law enforcement methods if disclosed publicly. Attorney General William Barr informed the heads of the House and Senate Judiciary Committees in a letter Friday that he might be able to advise them of Mueller's "principal conclusions as soon as this weekend." He noted also that neither Barr nor his predecessors had challenged any actions Mueller took during his probe. But with limited power to compel information from potential witnesses, congressional Democrats are looking to Mueller's findings to inform their investigations of Trump's campaign, businesses and alleged foreign ties - and insist they will be satisfied with nothing short of a complete account of the results and the evidence that informed them. "The Special Counsel's investigation focused on questions that go to the integrity of our democracy itself: whether foreign powers corruptly interfered in our elections, and whether unlawful means were used to hinder that investigation," House Speaker Nancy Pelosi, D-Calif., and Senate Minority Leader Charles Schumer, D-N.Y., said in a joint statement after Barr announced Mueller had completed his report. "The American people have a right to the truth. The watchword is transparency." According to the Justice Department, Mueller has not recommended any further indictments - news that Trump's defenders in the GOP took as vindication. "The reports that there will be no new indictments confirm what we've known all along: there was never any collusion with Russia," Rep. Steve Scalise of Louisiana, the House's second-ranking Republican, said in a statement. Trump's disdain for Mueller's probe, which he has labeled a "witch hunt," and his animus toward congressional oversight, which he considers "presidential harassment," have fed Democrats' suspicion that he might have something to hide and might attempt to force Barr to conceal any unsavory details from public view. As a result, Pelosi and Schumer warned Friday it was "imperative" Barr publicize Mueller's findings no later than the president was made aware of the report's contents. "Attorney General Barr must not give President Trump, his lawyers or his staff any 'sneak preview' of Special Counsel Mueller's findings or evidence," they said. "The White House must not be allowed to interfere in decisions about what parts of those findings or evidence are made public." Republicans say the full report should be released. But they have stopped short of echoing the Democrats' concerns, expressing faith that Barr will be as transparent as possible - indicating they will defer to Barr, not fight him. "We're jumping about 60 steps too far," said the Judiciary Committee's ranking minority-party member, Rep. Douglas Collins, R-Ga., when asked about Democrats' plans. "At this point in time I'm not going to question my attorney general's veracity or the fact that he's going to do what he says he's going to do. Until he proves me wrong." Regulations governing Mueller's work, which centers on Russia's interference in the 2016 presidential election and whether anyone in the Trump campaign conspired with those efforts, require the special counsel only to provide Barr with a confidential report explaining why he elected to prosecute certain individuals or declined to do so. Barr may release the report publicly, if he deems it "in the public interest." That is not required, though he is under considerable pressure to do so. "If the Special Counsel has reason to believe that the President has engaged in criminal or other serious misconduct, then the Justice Department has an obligation not to conceal such information," the Democratic chairs of the six House panels conducting investigations that dovetail with Mueller's probe said in a joint statement Friday night. "Anything less than full transparency would raise serious questions about whether the Department of Justice policy is being used as a pretext for a coverup of misconduct." Compounding Democrats' unease are remarks made in February by Deputy Attorney General Rod Rosenstein, who said the Justice Department should not reveal information about people it does not charge with crimes. That suggests the department will not release interviews, emails or other material concerning the president and others who were not charged, even though such information could be useful to ongoing investigations in the House. "I'm concerned that [DOJ is] signaling they're going to fight the Congress when it comes to [Mueller's] underlying evidence," said Rep. Adam Schiff, D-Calif., who as chairman of the House Intelligence Committee is leading one of six Trump-related probes in the House. The Senate Intelligence Committee is also examining Russia's activities surrounding the 2016 election, a probe that began shortly after Trump's inauguration. "We're going to have to pick and choose our legal battles," Schiff added, but "it seems to me there are few fights as important as this one." "No, no, no," he said. "Information that goes to [intelligence] sources and methods should not be public. But everything else should be." If negotiations fail to produce the complete report and its underlying evidence, then the Democrats will move to more coercive measures such as subpoenas, Nadler said. "The next step after that is to ask Mueller to testify in front of the committee," he said. If the Justice Department resists, Pelosi would have to decide whether to start a political battle by seeking to hold administration officials in contempt of Congress - a decision likely to result in lengthy court fights. The administration could also seek to prevent disclosure of material involving the president by claiming it is subject to executive privilege, but such claims are not absolute. Nadler and Barr met in March for a working lunch, their first face-to-face meeting. Nadler said he conveyed the importance of releasing the full report and underlying materials. Barr, he added, "just repeated that he'd do what he could and wanted to have as much disclosure as possible, period. He wasn't getting specific and couldn't get specific." "It should not be necessary that there be a formal impeachment proceeding for Congress to get that material," Schiff said. "It should be enough that Congress has a public purpose for it." Nadler said it's important for the public to see the full report, whether it implicates or exonerates the president, to begin to restore trust in government. "The reason Mueller was appointed in the first place is there's a crisis of confidence," he said. "To the extent he knows something or reaches a conclusion, the public ought to know it, and ought to know the underlying evidence." The Democrats intend to leverage a precedent set by the Justice Department during the last Congress in connection with Republican-led investigations into Hillary Clinton's use of a private email server, the dismissal of FBI Deputy Director Andrew McCabe and allegations of bias among law enforcement officials involved in the Russia investigation. In those matters, the department released to Congress hundreds of thousands of internal documents regarding the FBI's decision-making, and all underlying documents involving the surveillance of a former Trump campaign official. Though he warned against the practice then, Schiff said he believes the department should match or outpace that level of compliance with regard to Mueller's work, to avoid the "appearance of being orchestrated" by the president. The chairs of the six House panels investigating Trump, including Oversight, Ways and Means, Financial Services and Foreign Affairs, also plan to issue preservation letters to agencies that have provided information to Mueller, such as the Justice Department, the FBI, the White House Counsel's Office. They want the agencies to retain any memos, correspondence, or other information that could be relevant in their ongoing probes. The CIA, National Security Agency, Office of the Director of National Intelligence, and the Treasury and State departments also will receive letters. Democrats believe that Mueller's report and investigative materials will facilitate their efforts to further scrutinize Trump's campaign and administration, his personal finances and his business operations as they search for evidence of corruption or any effort to obstruct justice. "There may be a lot of useful information in there, even if we think some things are unnecessarily redacted," said Rep. Jamie Raskin, D-Md., a senior member of the Judiciary and Oversight committees. But as a first order of business, when Barr delivers a report on Mueller's probe to Congress, Raskin said: "We plan to read it."